By popular demand Teatro Círculo brings back its award winning production LA CAÍDA DE RAFAEL TRUJILLO by Carmen Rivera, directed by Cándido Tirado! In LA CAÍDA DE RAFAEL TRUJILLO, Rivera, sets up a series of events, internal uprisings, betrayal, international pressures and political intrigue, as well as the personal failures that led to the downfall of Rafael Leonidas Trujillo Molina. The controversial ruler of the Dominican Republic governed his country with an iron fist and massive blood shed for more than 30 years. 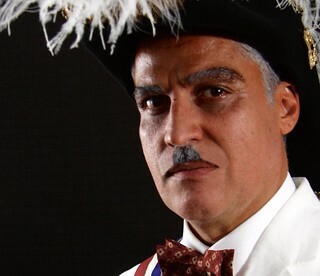 Delving into the last phase of his life, the play, based on historical facts and punctuated with Rivera’s inimitable creative narrative, tells a moving story of a man whose desire for absolute power poisoned his humanity and terrorized a nation. Limited engagement: October 16 to October 25, 2015 at The Rose Nagelberg Theater at Baruch College located at 55 Lexington in Manhattan. Performed in Spanish with English supertitles. Running Time: 2 hours and 15 minutes with intermission.